I’ve always been impressed with Ireland’s boldness when it comes to modern design – whether it be buildings, townscape or – today’s subject – signage. That’s probably because my working life was spent designing architecture mainly in England where the brief, too often, seemed to be to produce something that would look as if it had been around for a hundred years… I could never bring myself to turn out pastiche and, consequently, suffered many frustrations with clients and planning committees. 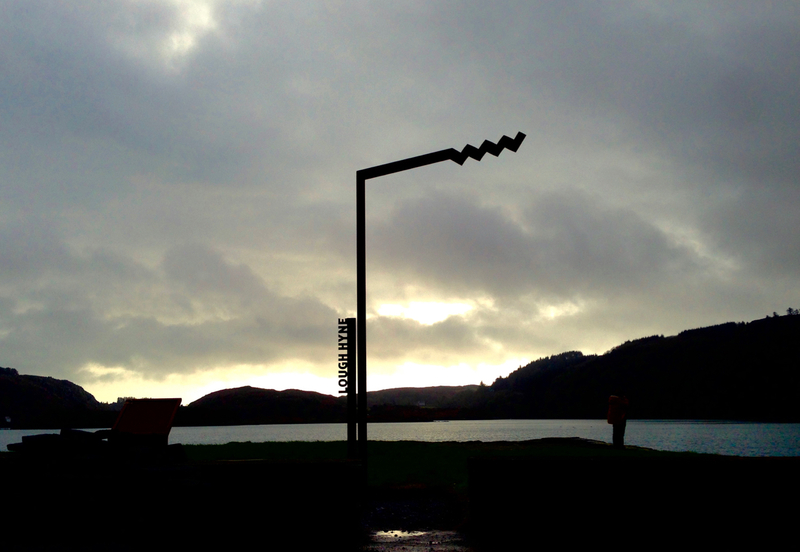 We have just been to see one of the new signs marking ‘Signature Points’ on the Wild Atlantic Way: it’s at Lough Hyne, a marine nature reserve just outside Skibbereen which we have mentioned many times before in our posts. 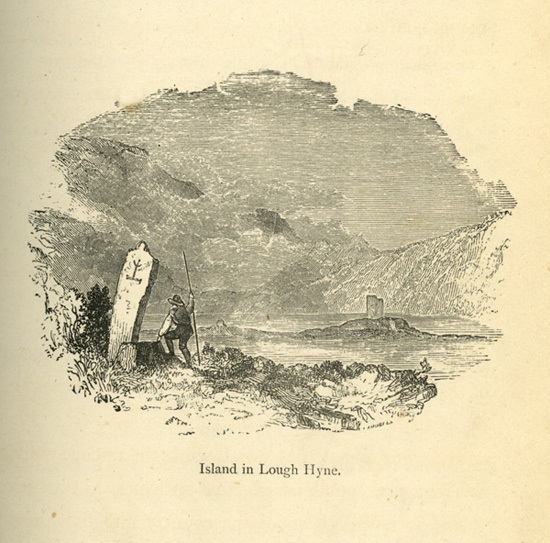 The Lough was a freshwater lake until rising sea levels flooded it with salt water – probably during the time when the Bronze Age inhabitants were carving their rock art in the area. The lake is now fed by tidal currents that rush in from the Atlantic through Barloge Creek. 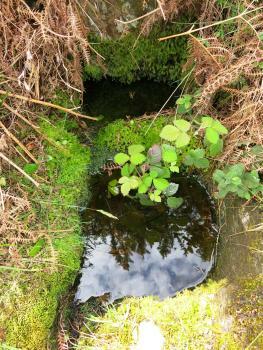 It’s one of the places that we take our visitors to: it has a quiet, rugged beauty – and a fair share of holy wells in its vicinity. The new sign is everything I would want from a 21st century waymarker: it’s simple but distinctive – completely of its time; well made from a long-lasting modern material – corten steel (mentioned in a previous post). It could still be around for archaeologists of the future to discover a few thousand years from now as the surface will use the natural rusting process to create a permanently stable and very attractive patina. It’s a contemporary monument and – like the landscape around it – rugged. The design incorporates the Wild Atlantic Way logo – very simply but subtly using a W, an A and a W. I commend Fáilte Ireland and their consultants in this project, Red&Grey Design. It’s worth looking at their website for a detailed description of the identity proposals and the way it all works. I believe the new signs have received some bad press, with complaints that they are ugly and detract from the natural environments that they advertise. Generally, however they are being placed where there are already car parks, cars, railings, seats, litter bins etc: human activity. 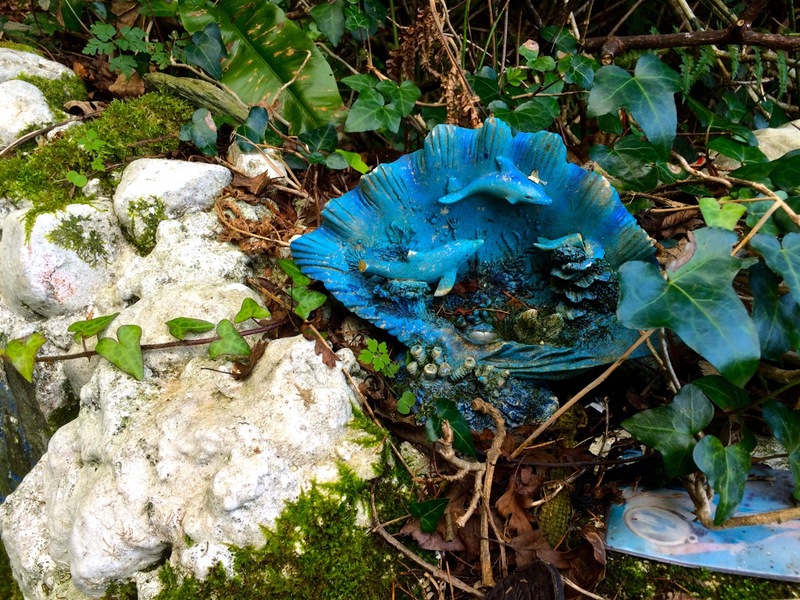 I don’t see any problem in adding distinctive and practical pieces of sculpture in such settings – a grand Irish initiative! Local tradition (and there is no better source of knowledge!) 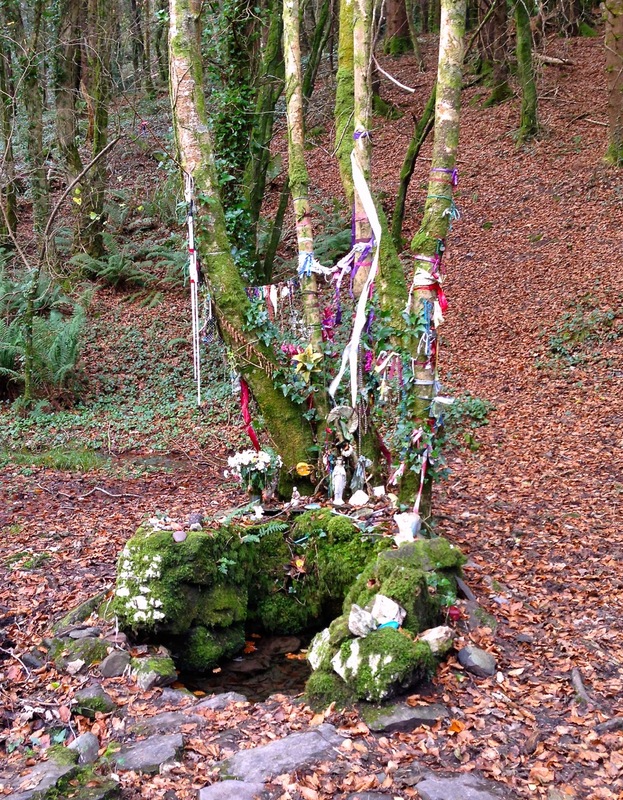 has it that you can relieve any eye problems with the waters from Tobarín Súl – one of the holy wells close by Lough Hyne. The name is Irish for Little Well of the Eyes and, if proof were needed of the efficacy of the cure, you will find hanging from the branches of the trees around the well white canes and spectacles presumably left behind by modern day pilgrims who are no longer in need of them after visiting the well. 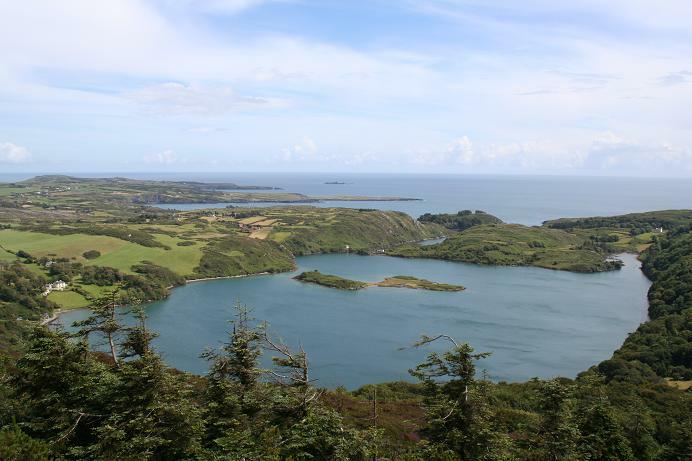 Tobarín Súl is set beside a narrow lane which winds up Knockomagh Hill in the townland of Highfield, to the north of Lough Hyne. The Skour Well is a little way further up the same hill. Nobody seems to know the origin of the name: one suggestion is that the word Skour comes from the Irish ‘sceabhar’ meaning ‘slope’ or ‘slant’, indicating its position on the side of a hill. 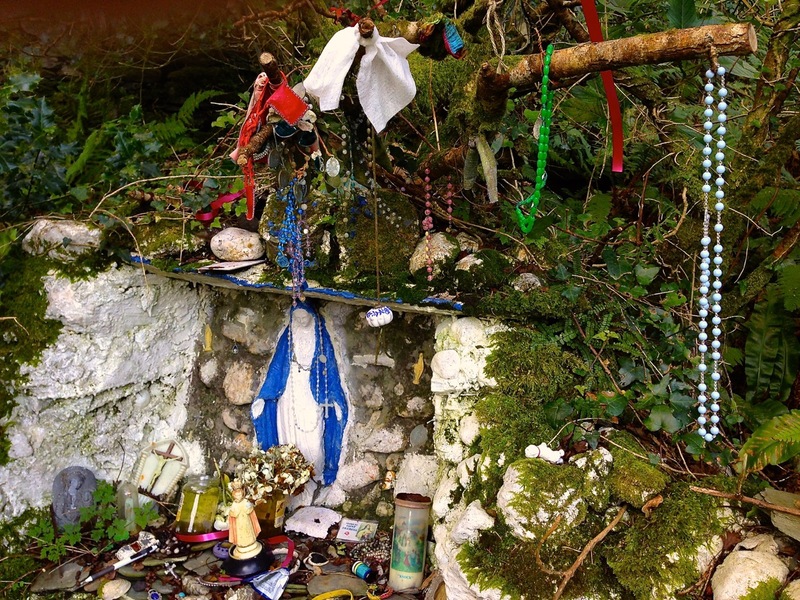 Whatever the origin, it’s another colourful well, also adorned but with a more religious flavour – rosary beads, candles and statuettes. Some sources suggest that this well is dedicated to St Brigit, but I think that is a confusion with two more holy wells which are reputed to be close beside an ancient ruined church dedicated to her on the south side of the lake. 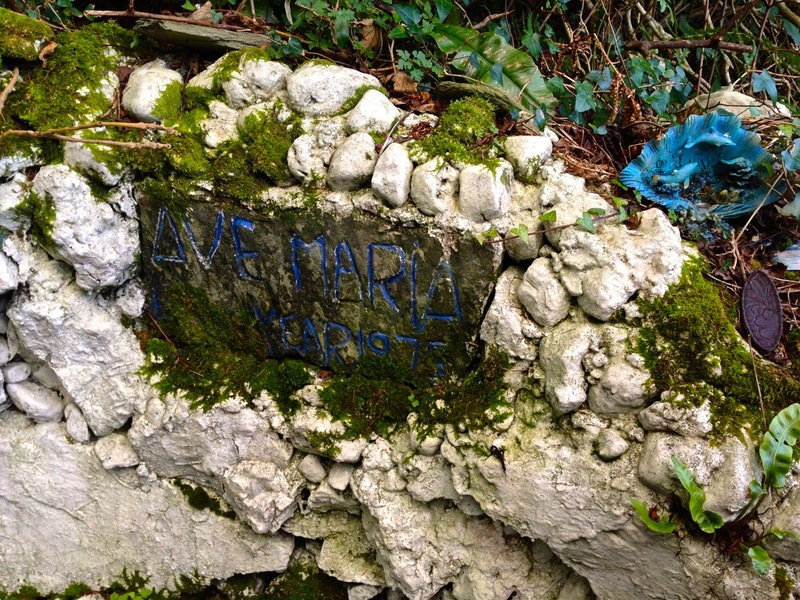 Skour Well, however, is clearly devoted to Mary and ’rounds’ are performed here: it’s said that pilgrims drop white pebbles into the water on completing each circuit. On May Eve the local priest conducts a mass at the roadside here. So here we have a fascinating meeting of beliefs: two wells almost side by side, one seemingly an ancient centre for traditional cures and the other a Christian site. Both are powerful places. We have mentioned the lake itself in previous posts. 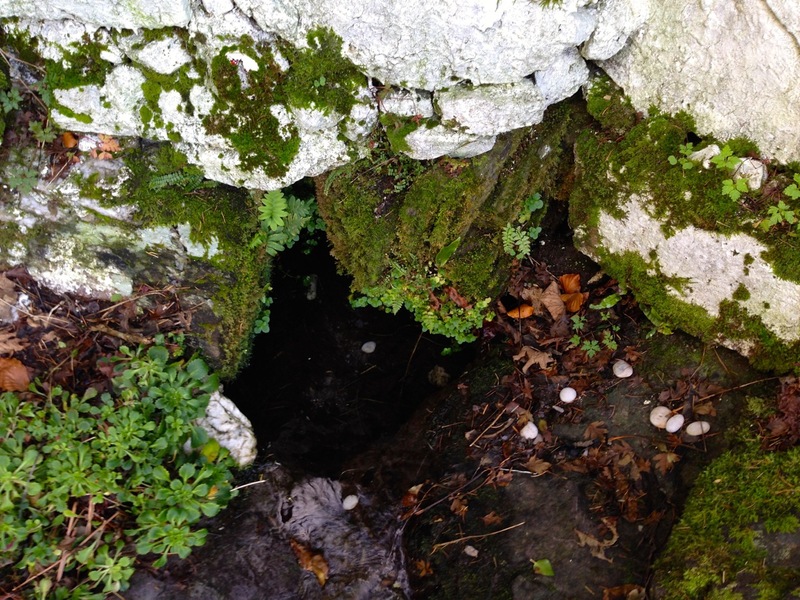 We have yet to visit St Brigit’s little church to try and find the other wells (the Archaeological Survey database says they are no longer visible) but we must look for the place where St Brigit knelt and left imprints of her knees in the rock! 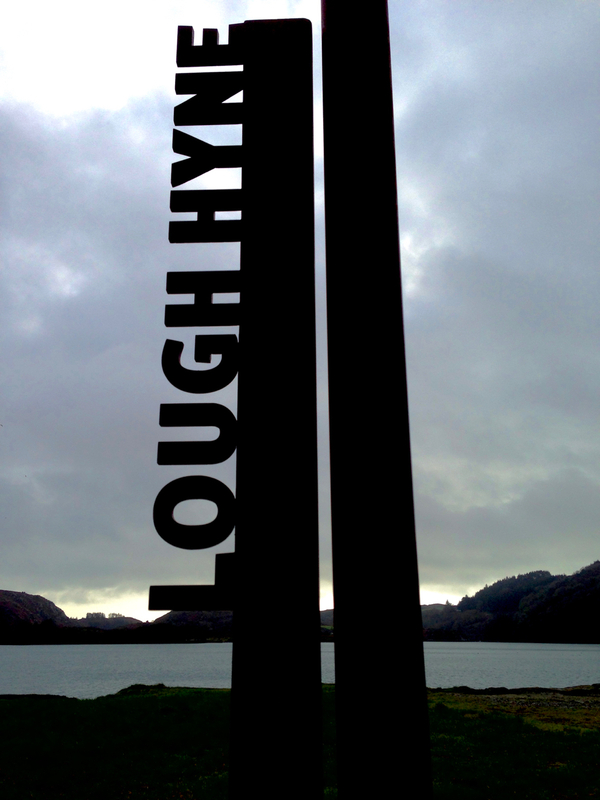 Lough Hyne is a unique ecosystem. A partially landlocked seawater lake, it is filled by the incoming tide and then empties twice a day, through a stretch of water called The Rapids. Aquatic marine plants and animals flourish in the warm protected waters – many not found elsewhere in Ireland. It’s also a beautiful and peaceful place, steeped in archaeology and history. In a kayak for the first time in years! 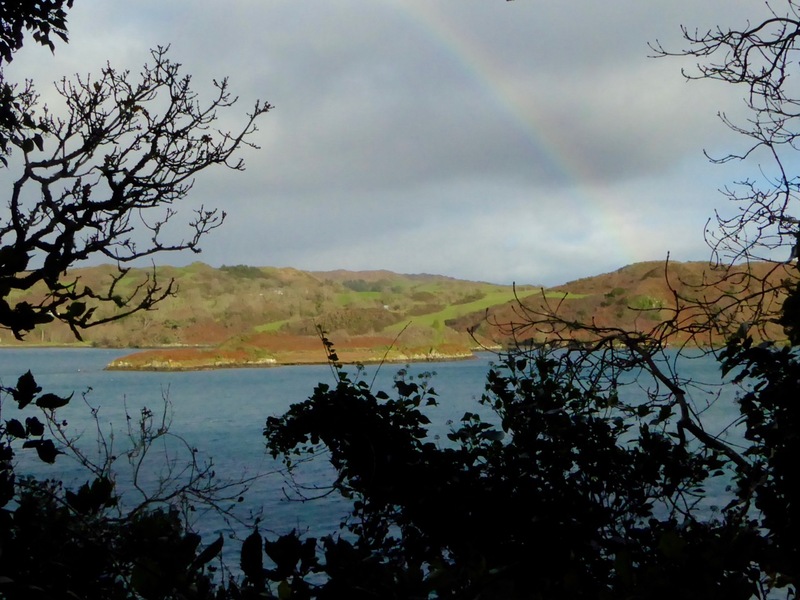 Jim Kennedy and his family run Atlantic Sea Kayaking and a couple of times a year, to coincide with local festivals, they offer a special kayaking trip on Lough Hyne called the Starlight Serenade. I was disappointed to have missed the first offering earlier in the summer so as soon as they announced a second one, during the Taste of West Cork Festival, I signed up to go with my friend Sheena Jolley. After a brief introduction to basic paddling techniques we were off, a group of about 20 of us, mostly local. Jim led us first to The Rapids, pointing out the birdlife along the way. It was an unusually high tide and the water was thundering in. We rafted up in a sheltering eddy, trying not to be too intimidated by the tidal surge. Jim explained the ecology of the constant filling and draining of the lake and then he pushed us out into the rushing water. Hanging on to each other’s kayaks, we swirled giddily in the torrent, gradually swinging back into the calmer waters of the lake. As dusk closed in the next stop was the island, and stories of an O’Driscoll warlord who once ruled supreme in Baltimore but who lived out his final days in this remote place. Then Jim told us to head ‘towards the light’ and pointed to the far shore. As we got closer the ‘light’ began to resolve itself. Several steps led down to a tiny quay and on each step and all over the quay were candles – dozens of them. Then we heard the music. Two violinists were playing Bach. One by one we drifted in, rafted up as silently as we could, and then lay back in the kayak seat and just listened. The Milky Way arced across the sky, the music floated to us from the little quay, we dangled fingers in the warm water and each of us felt in our own way that surely heaven couldn’t hold much better than this. The concert continued – some Telemann, a song composed by Jessie (these were two members of the Vespertine Quintet I reported on at the beginning of August), something gentle and minimalistic, more Bach – and then it was ‘follow the light’ again: this time the light was on the helmet of the lead guide. But before we started, Jim asked us to look down into the water and to dip our hands in. Suddenly, the stars were beneath us: bioluminesence shimmered and shook from our fingers. As we paddled back every stroke of the blade struck sparks from the water: flash on the right, flash on the left, flash, flash, flash, flash. It was hard to leave the magic that was happening on the water. Sheena and I walked back to where the cars were parked, breathless with the wonder of what we had just experienced. But wait…here were more candles and luminarias, and a table groaning with wonderful food, and grinning guides handing out cups of tea and glasses of wine, and Maria Kennedy presiding over a homemade feast of organic goodies: smoked salmon, seaweed scones (delicious! ), salads from her garden, cheeses and biscuits and cake and chocolates. We sat or stood in the warm night air, munching contentedly, unable to utter much more than superlative heaped on superlative. Words are inadequate tools to fully convey the essence of an evening like this. I can’t tell you. You have to do it too.